Our family vacation to Europe has not been, by and large, a beer vacation. That's OK, I didn't expect it to be, and in fact family vacations always give short shrift to beer. But the last few days in Amsterdam have been something of a beery reprieve for the man of the house, with several good beer bars, a couple of top-notch bottle shops, and even a surprisingly good cheap supermarket brand. That gives me material for several blog posts, but let me start off by tipping you off to the -- as of this writing -- last surviving member of the Gollem family of Amsterdam beer bars. Gollem's Proeflokaal, which wasn't on beermapping.com or Beer Advocate's BeerFly before my visit, is a charming and well-stocked pub, well off the beaten path at 160 Overtoom, but just a short walk from the Van Gogh Museum. We ended up there for lunch Saturday by accident -- no, really, the South Indian dosa place at the corner was closed -- and were very pleased with our burgers, vegetarian croquettes, and salads. Oh yeah, and by the bottle of Westvleteren 12 ($20). I was glad to get to a Gollem location, since the famed original Café Gollem in central Amsterdam has been closed for nearly a year because of some hangup with its license, and so has the Biercafé Gollem in the De Pijp neighborhood. The Netherlands has a lot going for it, government-wise, but it sounds like it is still possible to get crosswise with officious bureaucrats. Rumor has it that some kind of deal might allow the reopening of the other Gollem locations this fall, but meanwhile your only option is the Proeflokaal. It may not have the dark, cozy atmosphere of the original Café Gollem, but the Proeflokaal has a spacious, relaxed vibe, good food, and an excellent beer selection. Definitely check it out if you're in Amsterdam. @Sean: Thanks for the tips; we're already on to Bruges now. 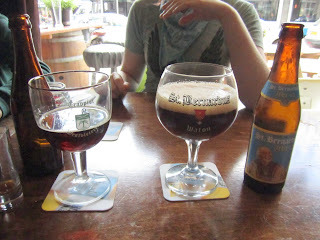 Amsterdam bowled me over with its beer scene, and I say that even though I didn't make it to *any* of your 3 suggestions. The places I did make it to were enough to keep me happy, and make me want to go back for more.